It's been quite a loooooong time since I updated this site. My readers, mostly friends, kept on texting me to update this blog and post some photos because they wanted to see the "NEW ME". 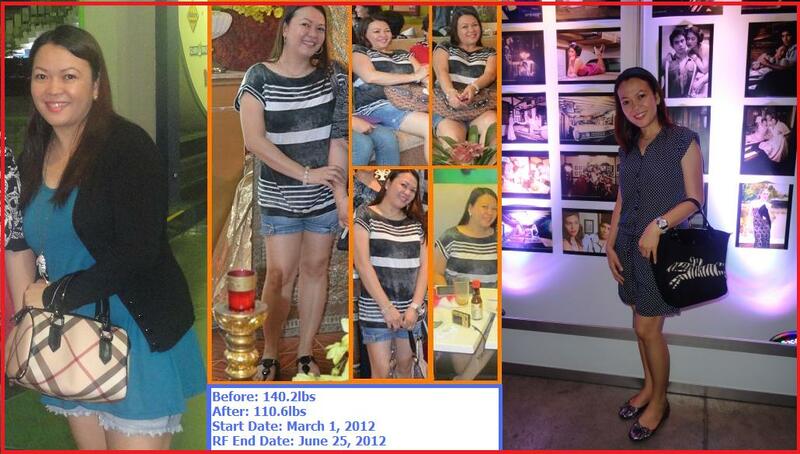 I started on March 1, 2012 with a weight of 140.2lbs. The center set my target weight between 106lbs-112lbs. I was informed to order my REFEEDING PROGRAM (RF) once I am 2kg (5lbs) away from my goal weight. I ordered my RF when I reached 115lbs, and it was turned over to me two weeks after. My consultant advised me to go beyond 112lbs before I start my refeed. 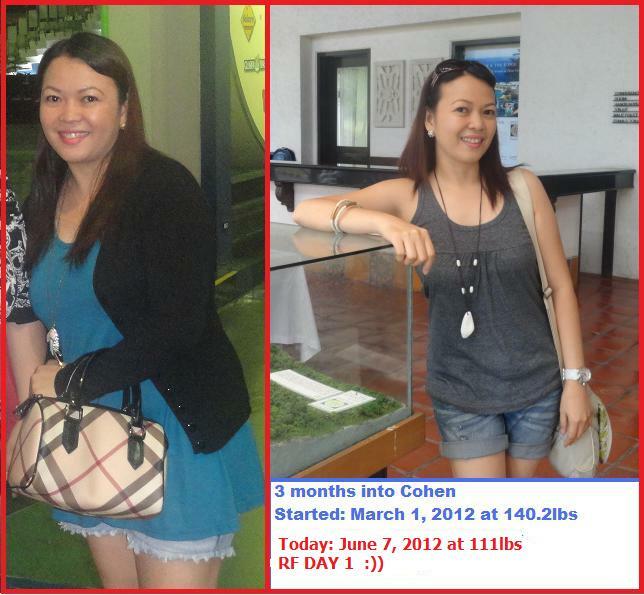 So I started RF on June 7, 2012 at 111lbs and ended June 25, 2012 at 110lbs. I did RF for 19 days. First 4 days was a breeze. The rest of the days until day 19 were complicated. I made use of my general knowledge in Mathematics: Multiplication-Division-Addition-Subtraction. Whew! Back to basics. He he! And btw, this RF program is basically done to re-introduce food like carbs back into the body and bigger portions are added so the body won't get shock in the maintenance stage. And yes, due to insistent public demand.. here's my before and after photos. TARAAAAAANNN!!! This is my picture which was posted in Facebook Support Group the day I started my refeeding program. This was my photo after the Refeeding program. From XXL clothes down to Large, down to Medium and now I can wear FREE SIZE. New wardrobe. New lifestyle. NEW ME!!!! Hi. May I ask if you've kept your weight off up to this time? I'll be starting the program soon and I just want to know how those who've undergone the program fared after sometime.